Everybody's Gone to the Rapture, from developer The Chinese Room, is as eerie as it is beautiful. It is a tale of the apocalypse that doesn't rely on the threat of wasteland bandits or hordes of zombies to send chills down your spine, it simply invites you to roam the abandoned English village of Yaughton and observe the events leading up to the extinction of the human race. The game is shown entirely from a first-person perspective; there are no cutscenes or shifts to third-person. With no compass or mini map to show the way, the only guide you receive is from a floating ball of light that hovers lazily in the direction you should be heading. Exploration off the beaten path is rewarded with hidden recordings and conversations to eavesdrop on, as well as meticulous details in the environment you might have otherwise missed. The controls are simple: the left analog stick moves you, the right analog stick moves the camera, X is used to interact with the environment, and holding R2 will increase your walking speed. That's it. You can interact with televisions, radios, telephones, and at certain points the ball of light will stop moving, allowing you to interact with it (by rotating the Sixaxis controller), revealing one of the final moments of the villagers. These scenes play out with silhouettes made of golden light, representing inhabitants that are now gone forever. The graphics are amazing, and clearly no expense was spared in the creation of the world. Many times I had a hard time moving on because I was so enthralled by what was in front of me, whether it was a picturesque view of the farmland or the odd light patterns in the night sky. Upon discovering some sheets hanging out to dry, I was delighted to find that I could move under them and they would realistically move as I passed through them, completely covering my character's head as I stood underneath, then falling off and returning to their original position. It is incredible the level of detail that has gone into this "budget" game. Perhaps it is because there are no human models that this was possible, but the light silhouettes that form the characters in flashbacks are well animated, and fit the style the game was going for perfectly. Unlike other games set in the post apocalypse, this one does not rely on a sparse soundtrack to set the atmosphere. Instead an ethereal choir sings in the background, swelling to new heights as you enter into a new chapter. As strange as it sounds, the beautiful music adds to the emptiness of the setting, providing a fitting dirge to mankind. Also of note is the quality of the voice acting, from the astronomer that speaks over the radios you find to the gossiping old woman, every character is unique and easily distinguished by their voices alone. Even though you never see the characters faces, you come to understand and empathize with them based on nothing more than their voice performances. That is pretty impressive. As you explore the remnants of the village and its countryside, details of the end times come into focus. It starts with a pattern in the sky that appears to be trying to communicate, yet its attempts are harming humans and animals alike. The government is brought in to quarantine the town, and those inside the quarantine zone are faced with some hard decisions. While somewhat vague, this setup allows for different interpretations, and is among the game's greatest strengths. I enjoyed venturing off the beaten path searching for clues to make sense of what happened. The game is divided into several chapters, each focusing on one of the villagers. Each story is effective at conveying the fear and uncertainty people face in extreme times, and each chapter concludes with a beautiful scene as they face the end. While I obviously enjoyed the game I concede that it is not for everybody. There are no points to score, no enemies to kill, no collectibles to find, and really no discernible goal whatsoever. Your character's movement speed is slow, and pressing R2 slowly accelerates you from a carefree stroll to a hurried walk. While I loved every second of it and frequently stopped to take it all in, I will warn you now that if you don't like the idea of slowly walking through a game where there is never any obstacles to overcome or enemies to slay, this game is probably not for you. Imagine if Bioshock Infinite had no enemies to shoot at and you begin to get an idea of what this game is like, a beautifully realized world with an eye for detail and an ear for dialogue. 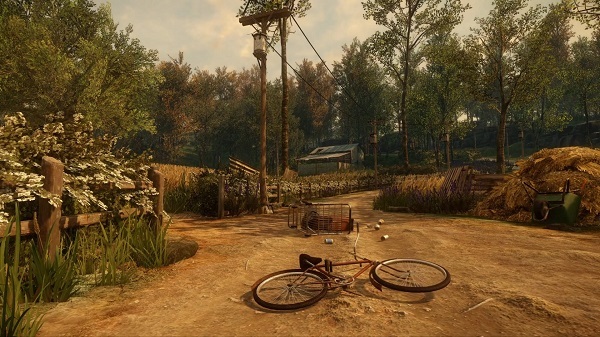 Everybody's Gone to the Rapture is easily one of the most immersive games I've ever played. That it accomplishes so much despite being a glorified walking simulator is to it's credit. It has gorgeous graphics, a gripping story, and an absolutely perfect soundtrack, and while it will only take you five hours to complete, chances are you missed something the first time through. When I reached the end credits my first trophy popped up, and after checking the list I realized there was still a lot to do that I had missed out on. This is easily one of the best gaming experiences I've had this year, and one I won't forget for years to come. All things considered, an interesting premise and good storytelling can't make up for bad game design. If the game were actually fun to play this would be an easy recommendation for anybody that grew up playing PC games in 90s, but as it stands not even the quality of the writing can save it. Unless you are a die hard fan of the author, I can't see any reason to recommend this, and if I ever become trapped in a videogame I hope it's a much better one. Even with over 400 puzzles solved, I still feel like I'm scratching the surface. Every time I venture back into the world I discover some small detail I missed or a new set of puzzles. There are over 700 puzzles in the game. In order to see the game's ending, you don't have to complete all of them, but they're always there to come back to after you finish the mandatory puzzles. The Witness is a complex game that rewards its most diligent players in meaningful ways. With a meticulously designed world and the elaborate puzzles that reside within it, The Witness is a game you won't want to miss.